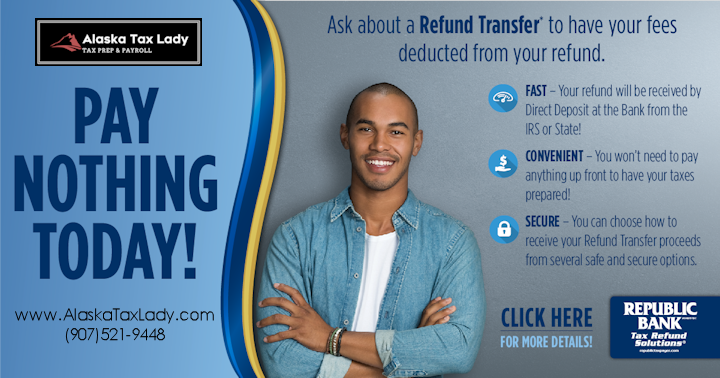 By choosing a Refund Transfer, you get the convenience of an IRS Direct Deposit without upfront fees. Once the IRS or state sends your refund (usually within 21 days) your fees can be deducted from the refund proceeds. The balance of your refund will be disbursed as a check and printed in our tax office, direct deposited into your personal bank account or loaded on a Netspend® Prepaid Mastercard®. Additional fees may apply to certain disbursements. Please consult Alaska Tax Lady for details.